The Arkham series was one of the most influential franchises during the last generation. Batman: Arkham Asylum created a combat system that has been replicated to no end. The sequel, Arkham City, decreased slightly in quality, but still offered a unique way to traverse across an open world. Unfortunately, the next installment, Arkham Origins (developed by Warner Bros. Montreal, as opposed to the original creators, Rocksteady Studios), left a foul taste in the mouths of fans. Despite the overwhelming thought that it was time to lay The Bat to rest, Rocksteady swooped in and created one final send off for arguably the most iconic figure in comic book history. Batman: Arkham Knight hopes to wipe that foul taste away, and leave with a bang instead of a whimper. At the conclusion of the last Batman installment, it seemed all was right in Gotham City once again. As one could guess, that proves to be false in Arkham Knight as Scarecrow reappears and threatens to unleash his fear gas on the entirety of Gotham City. Scarecrow’s fear gas is a neurotoxin that brings about the victim’s worst fears, eventually driving them mad after they are fully encompassed by their nightmares. This leads to the population of Gotham freaking out, and beginning to evacuate the city on busses. As this happens, it becomes clear that Scarecrow may be more focused on unleashing Batman’s true fears as opposed to taking over the entire city of Gotham. Gotham looks to be a bonus for the creepy figure as he constantly tortures Batman, attempting to push him into mental submission as every second passes by. 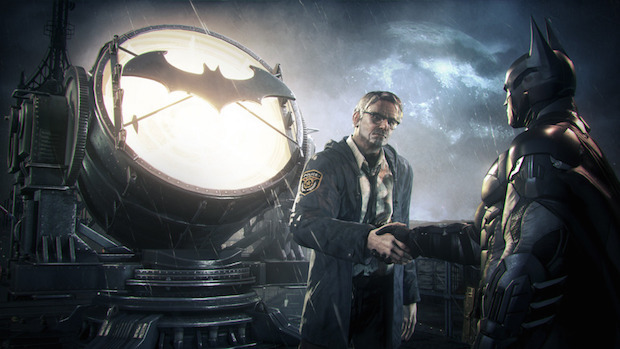 Scarecrow does not plan to do this alone, however, as he has recruited a brand new villain into the Batman universe named Arkham Knight. The identity of the Arkham Knight remains a mystery for a majority of the game, The only obvious things about the Knight is that he knows a lot about Batman, and has been tracking him since his earliest days in Arkham Asylum. The mystery surrounding the Arkham Knight is a fairly strong one, with his identity being up in the air. This is a trend throughout Arkham Knight, as the characters are easily the best parts of the story. The storyline prevalent throughout Batman: Arkham Knight is not the strongest, with the fear gas storyline bringing about a yawn every now and then. While the urge is there to save Gotham, it feels like something we have seen before. The real treat comes in the form of Batman’s interactions with the many characters you run into. Despite his plan being a bit dull, Scarecrow is a wonderful villain with a horrifying character design. The delivery of his lines only adds to his mysterious, hateful persona. Throughout the game, you are constantly curious as to what his end goal is. Does he want control over Gotham or is he just there to exact revenge on Batman? The detailed design and pitch-perfect voice work are two of the biggest reasons the characters you run into work so well. Watching Batman develop his relationship with Commissioner Gordon, Oracle, and even Robin can be engrossing due to the strong performances. The best character development is found within Poison Ivy as you watch her form a full character arch, filled with highs and tremendous lows, all within a few hours. It turns a character most people know little about into one of the most heartfelt, relatable stars in the whole game. The main story characters are not the only impressive appearances, as you even run into some other super villains during the many side missions. These appearances feel special and are a ton of fun to take part in. The only real slip up comes in the form of Joker. Much of the advertising for Arkham Knight has highlighted how Joker is dead, but they still find a way to weave him into a majority of the game. You will see him constantly appear and make unfunny quips while trying to get further into Batman’s head. He never ruins any of the other excellent character work, but he does feel incredibly forced. This is a project Joker should have stayed far away from. If you have seen any coverage for Arkham Knight up to this point, you know that the Batmobile plays a very large role in your time with the game. This is the first Batman game to bring in the Batmobile, and it is something you will be using for around forty percent of the missions. Many people were curious how Rocksteady would handle combat in such a quick car, and they did so by introducing another movement type that can be accessed by pressing L2. This transforms the Batmobile into a tank-esque vehicle, with a large rocket being at your disposal, as well as a machine gun that will pluck rockets out of the sky. As for what this does to combat, it becomes trivialized. There will be some late game events that can be tough to get through, but for the most part, it is very easy to just run through around twenty enemies as long as you are patient. When you hop into the tank mode, the direction of your enemies’ shots will be displayed via a red line. Your objective at that point is to dodge around and avoid the shots while firing your own. After repeating this for about ten minutes, you have yourself a successful combat situation. There are a decent amount of upgrades to be had for your Batmobile, such as stronger weapons and an EMP. These additions are fun to play around with, but they never feel critical to taking out enemies. As for traversing around Gotham City, the Batmobile works well. There is a unique destruction mechanic within the game that will allow you to take out corners of buildings, light posts, fences, etc. as you speed across the world. This small touch helps the actual driving tremendously as you do not have to worry about getting caught on small, protruding objects. That being said, it is still much more enjoyable to soar over Gotham City on your way to each destination. You can use your Batmobile as a launcher, to shoot Batman high into the air, and then glide effortlessly over the beautiful scenery surrounding you. The biggest annoyances with the Batmobile come later in the game as you are forced to use it frequently. There are even multiple boss fights designed specially around being in the Batmobile. These situations feel like Rocksteady pushing the vehicular mechanics too strongly on the player. The Batmobile is an acceptable addition to the franchise, but the player should be able to choose how much they want to use it. By far the most recognizable gameplay aspect of the Arkham series has been its unique combat. If you are unaware, the combat has you approaching a group of enemies and striking in basic fashion. But the hook is the counter mechanic, which is performed by pressing triangle when blue indicators appear above your enemy’s head, showing you they are about to strike. This system has returned in full force for Arkham Knight, and has brought along a few new tricks as well. You can now use different pieces of the environment to take enemies down such as steam pipes, large light fixtures, etc. While you have always been able to perform basic takedowns that immediately incapacitate an enemy, Arkham Knight has introduced a few new takedowns to Batman’s arsenal. There are certain situations in the game that will find you fighting alongside another character (Cat Woman, Night Wing, Robin, etc. ), during these times you can perform dual takedowns that will involve both characters. From there, you begin playing as the other character for however long you want. This introduction of switching between characters mid-combat is a really smart addition; the only negative is that it does not happen often enough. Due to the combat being around since Batman: Arkham Asylum’s release in 2009, and also thanks to many other games attempting to replicate the style, attacking a group of enemies head-on is not the most exciting strategy. While the new additions are nice, they do not fix the dull moments of hammering on X until you see a counter opportunity. You will still run into more than a few exciting moments, but Arkham’s combat is beginning to show some age. If you do not want to attack your enemies head-on, the stealthy option is always a possibility. In the case of Batman’s stealth, you look down upon enemies as you grapple between different objects and look for your perfect opportunity to strike. In past iterations, you would simply pop out whenever an enemy was alone. That is no longer the case as Rocksteady has introduced a Fear Multi-Takedown option, which will allow you to quickly eliminate three enemies, while also making a little noise. The simple premise is that the group of enemies is shocked to see Batman appearing out of nowhere, and therefore, are open to his stealth knockdowns. You perform this by entering a slow motion scene, wherein you slide your sight from target to target; with the person you want to attack being outlined by a yellow glow. This is a brilliant addition that really helps intensify the stealth situations further. This is the kind of smart extension that would really help the basic hand-to-hand combat within Arkham Knight. When Batman: Arkham City exposed the entire landscape, it felt a little barren of life. While it was nice to fly around, there didn’t seem like a lot to do around town. That has been wholly corrected in Batman: Arkham Knight as there is a plethora of objectives littered around the city. As always, you will find a decent amount of Riddler activities to participate in, many of which are an absolute blast. You will also find a host of other superheroes/villains around the city that have objectives based around them. You can stop Two-Face’s bank robberies, help find a murderer who is hanging people up and playing opera music (two terrifying actions in one criminal), save captured firefighters, and many other pieces of content led by strong characters with unique side stories. Rocksteady listened to the lack of content complaint and delivered one of the most jam-packed game worlds in the past few years. As with many games this generation, the PS4 version of Arkham Knight has some occasional frame rate dips. These issues are only noticeable during some of the more high-octane Batmobile sequences. As for the combat and investigation aspects, things look very similar to what you have come to expect from Arkham. The world is a gritty, dark blue-heavy environment running on Unreal Engine 3. In spite of that, looking at Arkham City as you soar high above is very pleasing. There is a certain light and beauty that emanates from every building below you. The biggest star in the visual department is the aforementioned character design. Of course, Batman looks fantastic and his deteriorating suit is always a nice touch. But the attention to detail on every character is noticeable at every sight. Simple touches like Commander Gordon’s drooping, worried eyes come across tremendously and manage to deliver character without him having to say a word. While the reputation surrounding the Batman series has been steadily decreasing since Arkham Origins, Rocksteady managed to knock one last Arkham game out of the park. While the emphasis on the Batmobile late in the game can be incredibly tiring, the characters and world around you never stop propelling you forward. Combine that with the numerous upgrades for your weapons and plethora of side content available, and you have one hell of a Batman video game. Batman can now fly into the night knowing he left with a bang.